Why did it take me eight years into homemaking to discover this? This is on once-a-week rotation here in our house! It’s been a true joy to know how to properly roast a REAL healthy, farm-fresh or kosher chicken. It’s a pure delicacy. The dread of ruining a beautiful meal has been replaced with anxious anticipation! And a teeny bit of pride! I was suspect at first, because this seems a little TOO easy. And that the oven is too hot. But, with a step of faith, I tried this, and I was forever converted. The meat’s flavor stands on its own, no need for any added spices or flair. I like to think of myself now as a chicken purist :). The skin is crispy and deliciously crunchy; the meat is succulent. Preheat oven to 450. 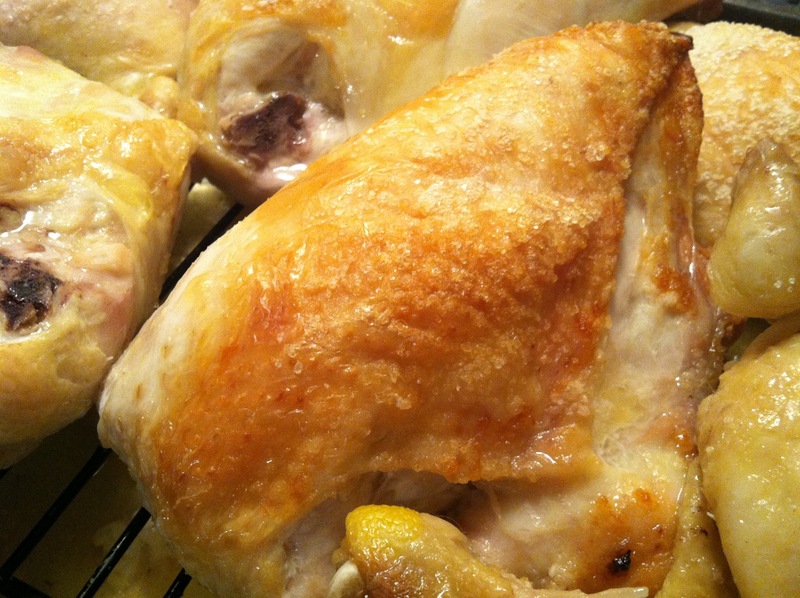 Wash chicken and thoroughly dry the chicken inside the cavity and out with paper towels. Set the chicken in a roasting pan and generously sprinkle the entire chicken with sea salt (inside the cavity as well). No tressing, no added oil…just salt. If you don’t own a roasting pan, cut 5-6 large pieces of foil, ball them up, and rest the chicken on the foil balls in a 9×13. Leave the chicken for about an hour in the hot oven. Set on the counter for about 10-15 minutes to allow the juices to settle before you carve it up. Try to keep from picking at the crispy skin while you are preparing your table!! You can also roast a whole cut-up chicken using this same method. It took about 40-45 minutes to roast the pieces that way. Too easy! Definitely trying this asap! Thanks Leigh! Great! Just bought two pastured birds that I can do this with!